Before today, I had never attempted to make homemade slime. It seemed like it would be intimidating and take along time. 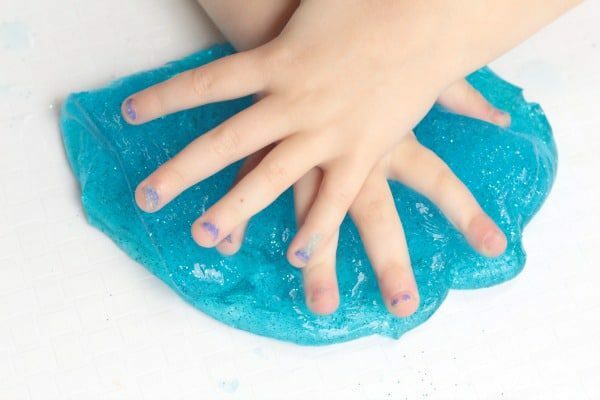 But surprisingly enough, it using this easy slime recipe it wasn’t difficult at all and making classic borax slime is one of our favorite ways to teach kids about chemical bonds. Since this first attempt at slime, we have made tons of other versions! 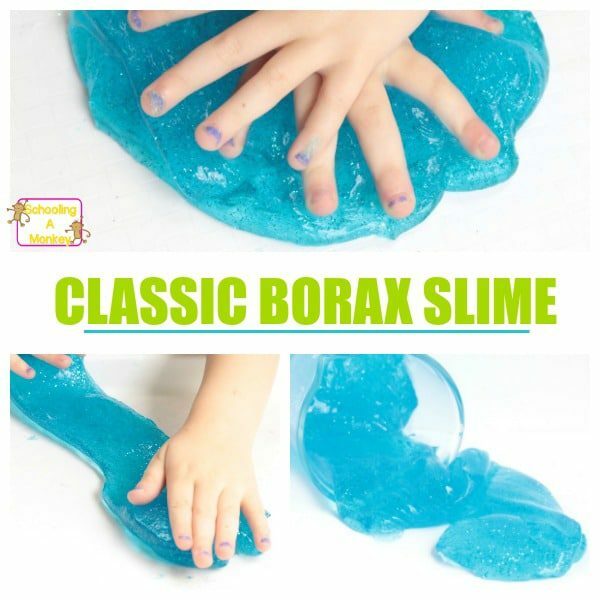 This version is made with Borax, and is the classic Borax slime that most people think about when you think about homemade slime. But there are a lot more ways to make slime! 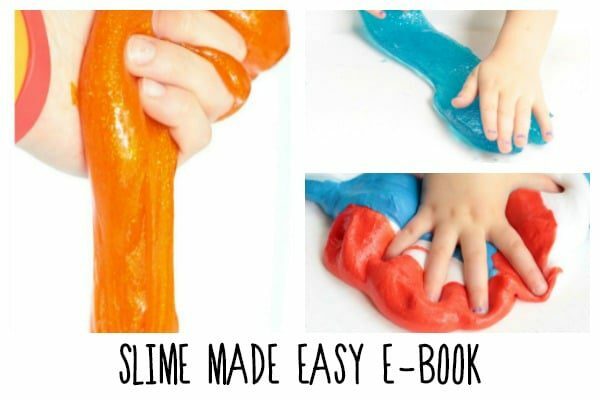 You can see all our slime recipes in one place here. 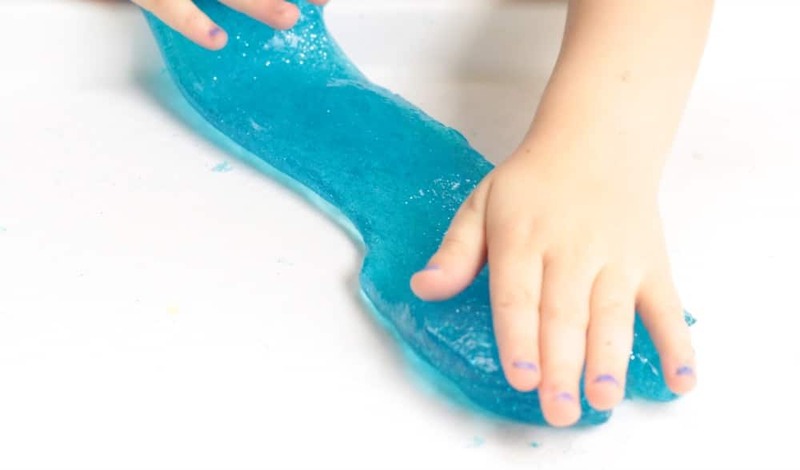 Read on to see how to make this easy slime recipe! 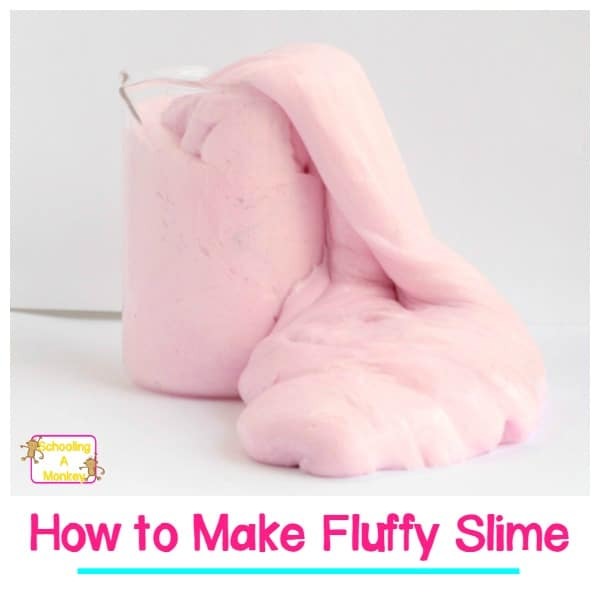 And if you love this slime recipe, try these other versions: fluffy slime, edible candy slime, laundry starch slime, and baking soda slime. 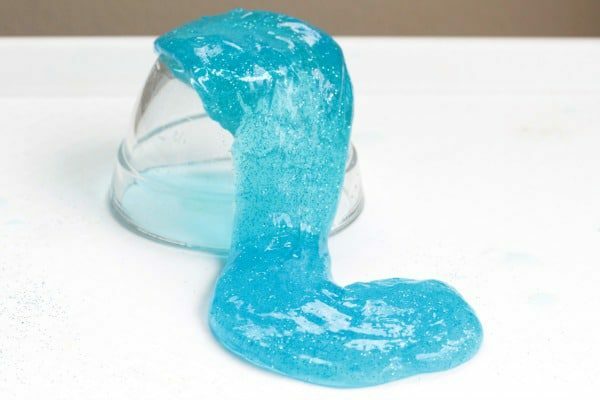 Borax slime is one of the best slime recipes because it is easier to make than many of the common variations. 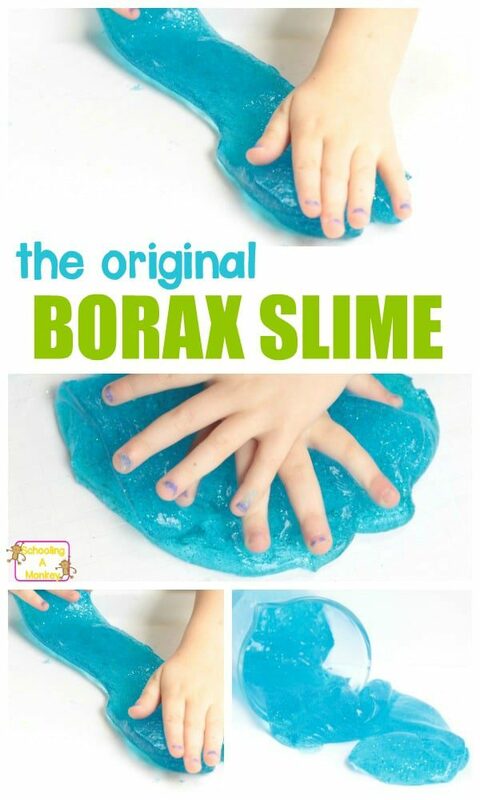 Borax slime also lasts longer, which means you can keep playing with it for weeks, rather than just a few days. 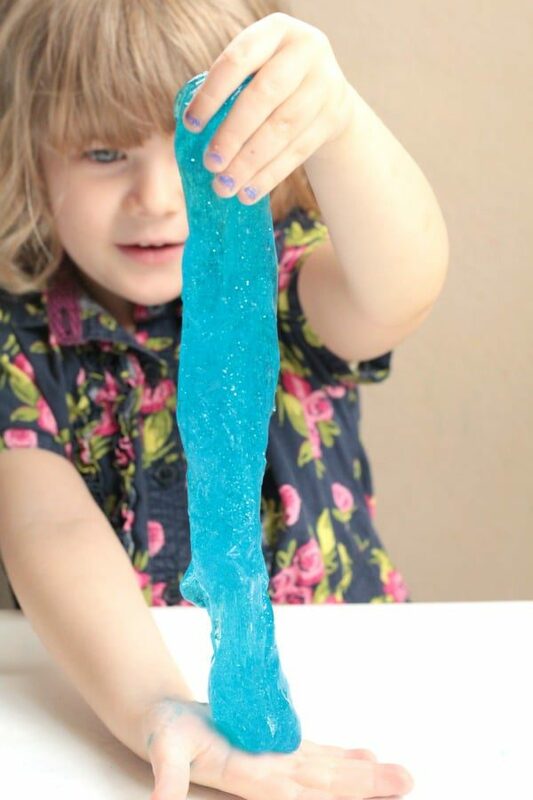 When borax slime gets too sticky, you can add a bit more of the borax liquid to the slime and return it to its original stretchiness! Slime is made when boron mixes with the polymer chains in the glue, creating strong, but flexible bonds between the molecules. This bonding process is known as crosslinking. Crosslinking creates molecular bonds that are crossed like a thatch roof, rather than in one long segment like a chain. Follow these directions and you’ll have the best easy slime recpie ever! Slime forms when polyvinyl alcohol and borate ion mix. The polyvinyl alcohol is attracted to borate ion, which causes them to form long chain molecules. When this reaction occurs, the two separate materials mix and slime is formed. 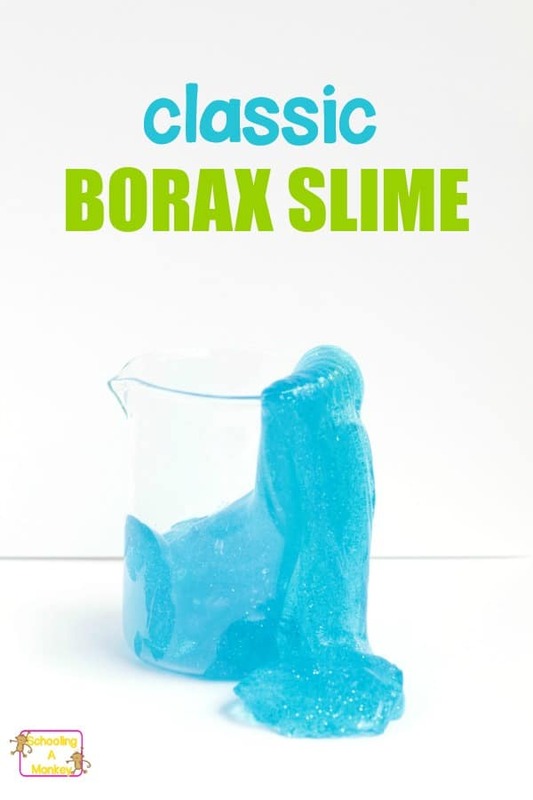 Follow these simple directions to make the classic Borax slime! 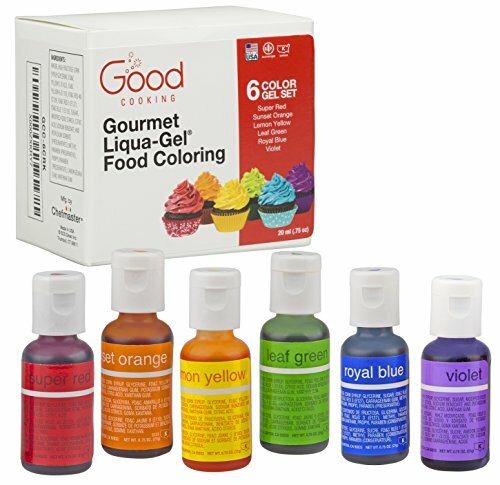 Make exactly according to this recipe, we haven’t had any problems with slime causing allergic reactions or skin burns. However, some individuals may be more sensitive than others. 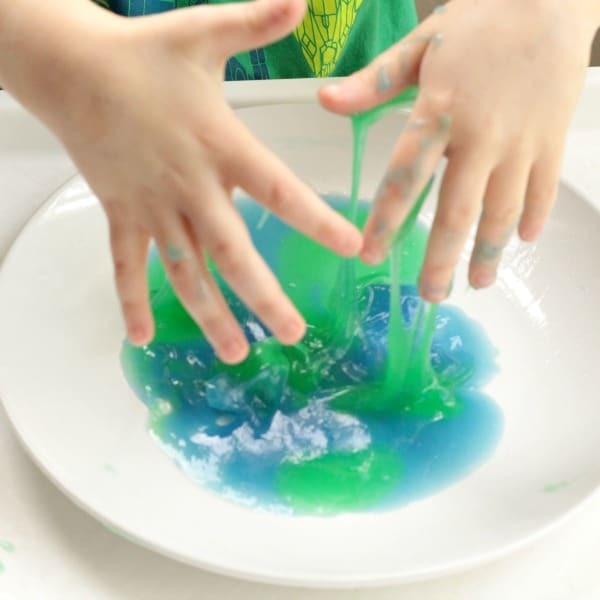 Don’t let kids play with this slime recipe if you notice any ill effects. 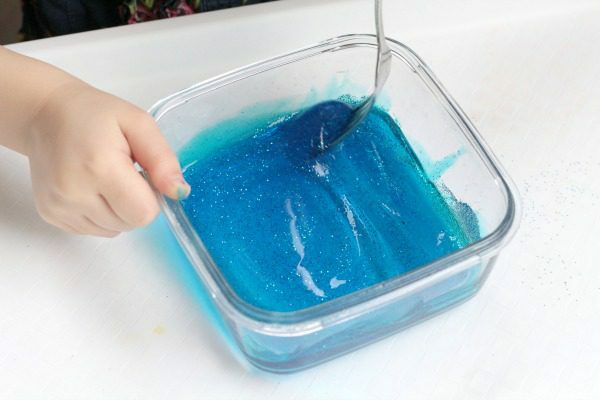 Additionally, only make this version of slime if your kids will not put it in their mouths. 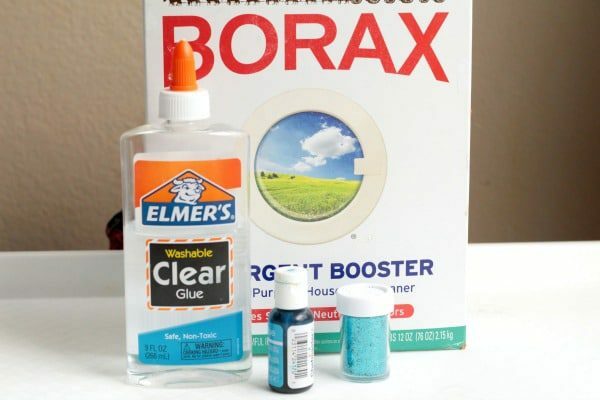 Borax powder (and glue) should not be consumed. Mix about ½ a cup of water and a teaspoon of borax until the borax dissolves. 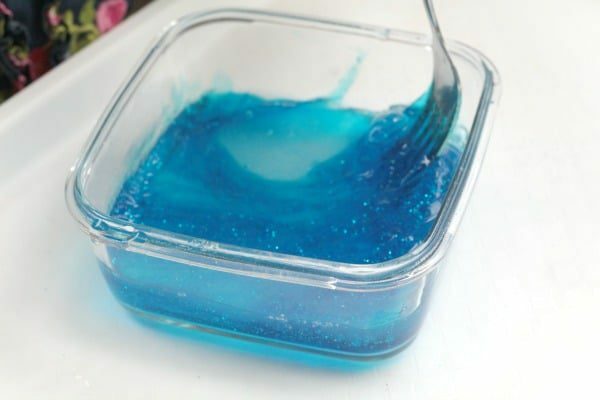 Dump 1/2 a cup of clear glue into a separate bowl, and add a few drops of food coloring and a bit of glitter if you like. 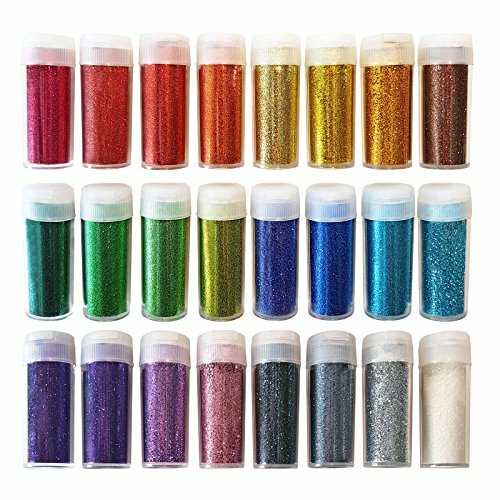 My kids love sparkly things, so we added glitter, but if your kids don’t like sparkles as much, just add color. Add 1/2 a cup of water to the glue mixture. Pour the borax mixture into the glue mixture. Stir for a few seconds with the spoon, then use your hands for the rest of the mixing. We thought our slime would be really oozy, but it turned out stiffer than we thought it would. 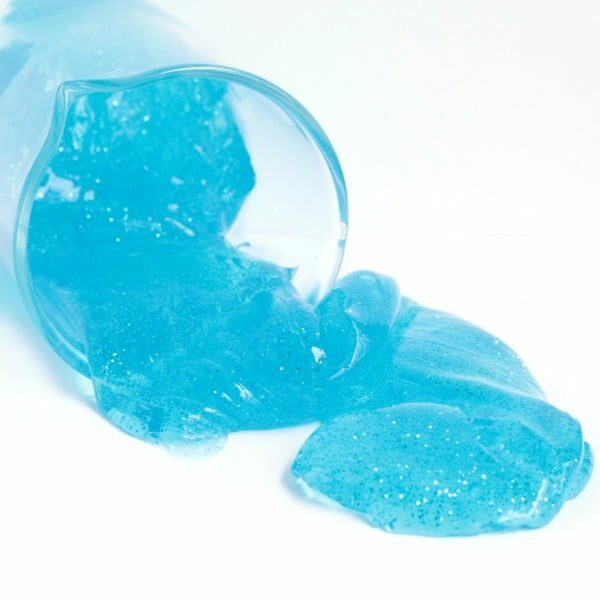 This is because Borax slime produces a stiffer consistency when used with clear glue. 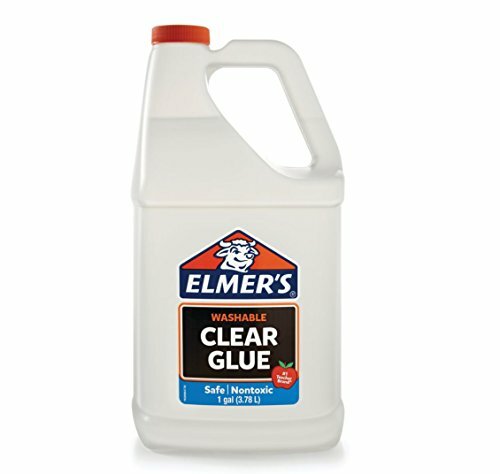 If you use it with white glue, it will be a little more flexible. However, it will never be as flexible and stretchy as laundry starch slime, which is why we prefer using laundry starch for our slime. Although contrary to popular belief, laundry starch slime does contain borax and is not a borax-free slime. When you pull the slime slowly, it stretches like hot cheese. When you pull it quickly, it breaks apart like cold cheese. The girls loved squishing the slime, watching the pieces reform into a solid whole, and in Bo’s case, she loved crumbling our slime into tiny pieces. Don’t forget to check out the other posts in the 31 days of STEM activities for kids series!